I’m pretty sure that you already saw Kapurpurawan Rock Formation photos that posted on the ads wall of Manila Metro Rail Transit System also known as MRT. The ad banner features Ilocos tourism campaign "Paoay Kumakaway" showing two beautiful Filipina with the background of white rock formations..
Kapurpurawan Rocks is one of the must-see destinations in Ilocos province. It is located in the rocky coast of Burgos, Ilocos Norte. You will take about 3km away from the Hi-way and 5-10 mins trek/walk from the drop off area. There is also horseback riding available in the area that will take you to the rock formations. The horseback riding charge about P100. 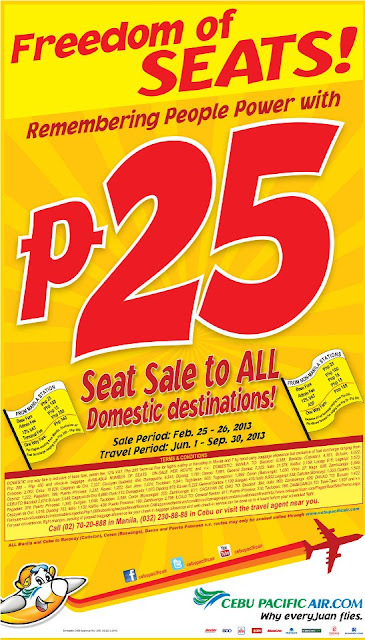 Zest Air/ Fly Zest offers now Domestic Seat Sale for as low as P288 on your favorite destinations in Luzon, Visayas and Mindanao, that runs from February 26 to February 28, 2013. Travel Period May 15 to July 31, 2013. Domestic destinations covered by 288 pesos promo include Manila Kalibo (Boracay), Busunga (Palawan), Puerto Princesa, Marinduque, Legazpi, Masbate, Tacloban, Tagbilaran, Iloilo and Cebu. Get ready for out of the country tour as Cebu Pacific now offers 50% OFF to ALL international flights including Manila to Jakarta, Kuala Lumpur, Macau, Singapore, among others until February 28, 2013 or until seats last. Travel Period is from Apr. 15 - Jun. 30, 2013.
INTERNATIONAL one way fares are inclusive of base fare, admin fee and 7kg. hand-carry baggage allowance but exclusive of Php 450 - Php 550 International Terminal Fee, Php 1,620 Philippine Travel Tax, fuel surcharge ranging from Php 615 - Php 2,665 and check-in baggage. Country specific taxes ranging from Php 403 - Php 1,026 are computed on top of quoted one way fares for flights departing from International destinations. All Cebu Pacific promo are subject to rules and conditions. For booking and reservation on tickets visit www.cebupacificair.com, or call Cebu Pac hotlines (02) 7020-888 (Manila) or (032) 230-8888 (Cebu). Cebu Pacific released its newest Freedom Seats promo to celebrate 27th EDSA People Power Revolution Anniversary Celebration. 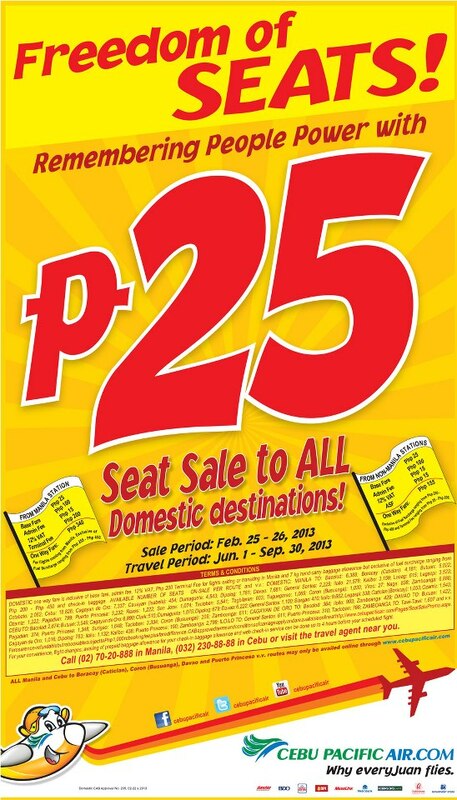 The seat sale is to all domestic destinations that runs from February 25 to 26, 2013. Travel period is from June 1 to September 30, 2013. Air Philippines now offers P27 promo sale on selected domestic destinations from February 25 to 28 2013. Travel period is from September 1, 2013 to September 30, 2013. Cebu Pacific offers international flights for as low as Php 699 on South East Asians destinations until February 25, 2013 or until seats last. 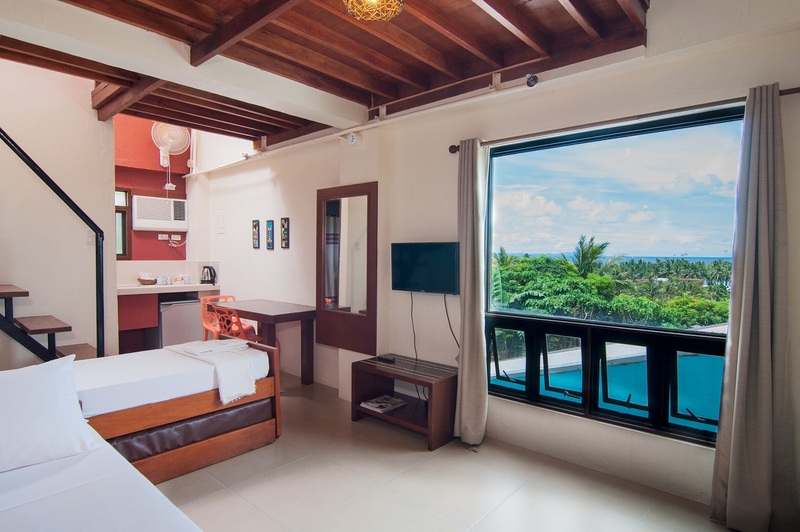 Travel period is from April 1 to June 30, 2013.
International destinations covered by 699 pesos promo include Manila to Brunei, Kota Kinabalu or Siem Reap. Bantay Church and Bell Tower is one of the famous landmarks in the town/barrio of Bantay (Ili ti Bantay in Ilokano) in Ilocos Sur. The church is also known as "St. Augustine Parish" and "Sanctuary of Nuestra Señora de La Caridad. The historical church is about 10-15 mins Kalesa ride from the Calle Crisologo of Vigan. There are also available tricycles that will bring you to the church. The fare is minimum 15 pesos. You know what, you can actually get there by means of walking. Of course you can do that if you started walking in the morning before 9 am and in the afternoon after 4pm. If you avail package tour from a organization/group or travel agency, Bantay Church and Bell Tower is part of the Vigan Heritage Tour. Aliwan Fiesta 2013 will present again another amazing street parade joining nineteen festivals from Luzon, Visayas and Mindanao on April 13, 2013 at the Star City Complex in Pasay City. Everyone will witness different cultural festivals wherein contingents compete in dance parade and float competitions, as well as in a beauty pageant. Grand Champion will get 1 million pesos. The Philippine International Hot Air Balloon Fiesta will celebrate its 18th year on February 21-24, 2013 at the Omni Aviation Complex, Clark Special Economic Zone in Pampanga. Calle Crisologo is one of the famous historical sites in Vigan, Ilocos Sur. This is the best place if you want to see Spanish colonial architectures. It is consider the major attraction of the town because it is filled with Spanish-style houses which have been preserved for more than hundred years. From the bus terminal, there are tricycles (P15 minimum) that will bring you to the place. If you already in the Vigan’s Calle Crisologo or Mena Crisologo Street, a walk or a calesa ride is a MUST. Calesa charge about 150 pesos per hour. Going to Ilocos is not that easy. Just imagine, you will be seated in a bus for 9-10 hours before you reach the town of Vigan, 2 hours from Vigan to Laoag and another 2 hours from Laoag to Pagudpud. "Patience is really a Virtue" when you want to explore the beauty of whole ILOCOS. Anyway, these long trips will give you the ultimate experience of your life. 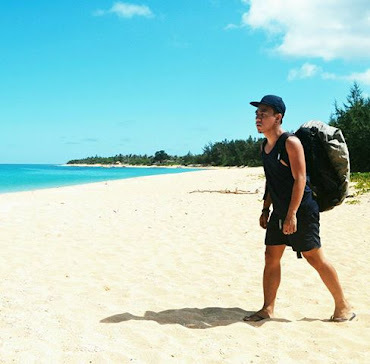 The provinces of Ilocos Norte and Ilocos Sur offer both historical and natural beauty tourist destinations that will surely make everyone enjoy and fall in love with the north. I’m really excited to tell you the whole story of my adventure. 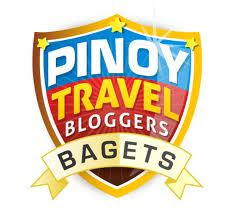 But let me first give you some travel tips, advice and other information that will help you for a wonderful getaway in Ilocos.